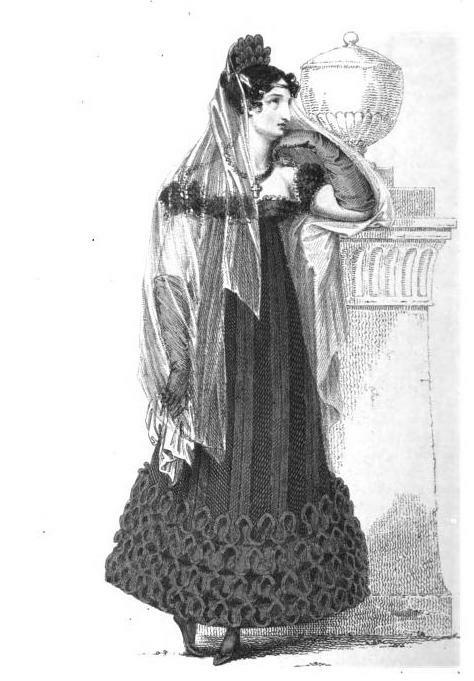 today’s prints are particularly interesting because they don’t just show what dress styles were fashionable in the winter of 1817, but they were taken from clothes actually bought and worn by one of the magazine’s subscribers. Apparently, they were purchased from a certain Mrs Bell’s in St. James’s-street. I can’t help but wonder who the buyer was and in which occasions she donned these beautiful gowns. Don’t they all look gorgeous? My favourite is the ball dress. And yours? A soft white satin slip, over which is worn a dress composed of white spotted gauze. The body, which is cut extremely low all round the bust, is finished by a light quilling of blond, which stands up round the bosom, and a full bow of ribbon in the centre of the breast, which has an effect at once tasteful and delicate. Long sleeve, composed of transparent gauze, which is striped with satin; these stripes are byas, and they are each ornamented in the middle of the arm with a pearl button: it is finished at bottom by a single fall of blond. Half-sleeve, to correspond with the body. For the trimming of the skirt we refer to our print; as we are not permitted to describe it: we can only say that the materials are extremely elegant and novel. The hair is dressed rather high behind. The front hair is parted on the forehead, and disposed in light loose ringlets on each side of the face. Head-dress a fichu a la Marmotte, composed of rich blond and satin, and tied at the side in a bow of the same materials. Earrings and necklace pearl and topaz. White satin slippers, and white kid gloves. Cambric muslin high dress, the lower part of the body made full, and the upper part, which is tight to the bust, composed entirely of rich work. A row of pointed work forms a narrow pelerine, which is brought rather high on the bosom, and ends in a point in front. The bottom of the skirt is finished by a deep flounce and heading, composed of the same material, which is surmounted by a row of soft muslin bouffone let in at small distances from each other. 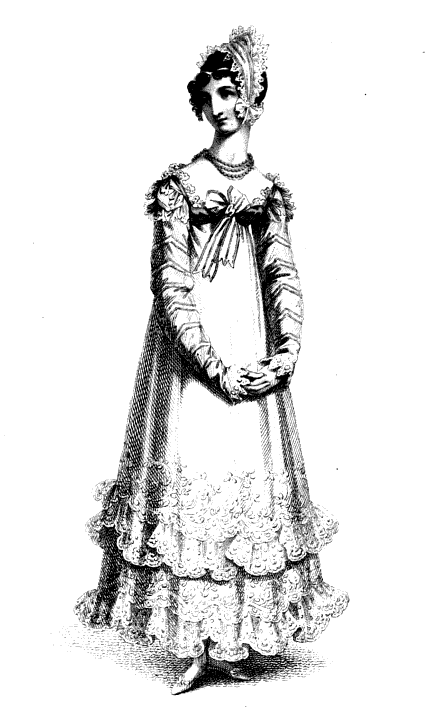 Over this dress is worn a spencer, composed of grits de Naples, ornamented with figured buttons, which are intermixed with a light, novel, and elegant trimming. For the form of the body we refer our readers to our print. The sleeve, of a moderate width, is finished at the wrist, by a double row of buttons and trimming intermixed. The epaulette, of a new and singularly pretty form, is edged with trimming, and finished with buttons on the shoulder. Autumnal bonnet, the front rather large, and of a very becoming shape; the crown low: it is tied tinder tire chin by a large bow of ribbon. We are interdicted from describing either the novel and elegant materials bf which this bonnet is composed, or the ornament which finishes it in front. Swans-down muff, lilac sandals, and pale-lemon colour kid gloves. A black crape frock over a black sarsnet slip. The skirt of the frock is finished by full flounces of the fashionable chevaux de frise trimming. The body, which is cut very low round the bust, is elegantly decorated with jet heads. Short full sleeve, ornamented to correspond with the body. The hair is much parted in front, so as to display the forehead, and dressed lightly at each side of the face; the hind hair is drawn up quite tight behind. Head-dress a jet comb, to the back of which is affixed a novel and elegant mourning ornament; and a long black crape veil placed at the back of the head, which falls in loose folds round the figure, and partially shades the neck. Ear-rings, necklac, and cross of jet. Black shamoy gloves, and black slippers. 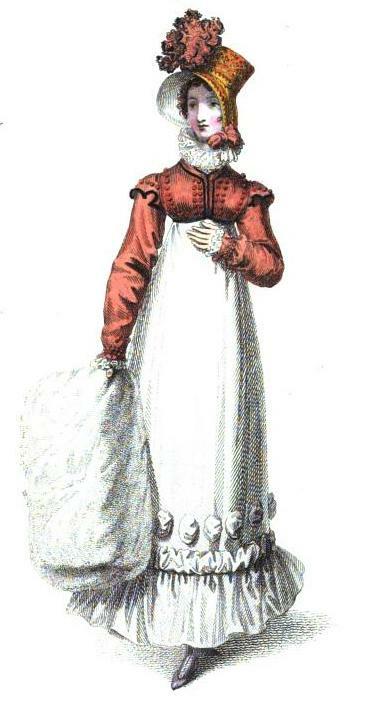 A high dress composed of bombazeen; the bottom of the skirt is ornamented with black crape, disposed in a very novel style. The body, which is made tight to the shape, wraps across to the right side; it is adorned in a very novel style with pipings of black crape disposed like braiding, and finished by rosettes of crape, in the centre of each of which is a small jet ornament. Long sleeve, tastefully finished at the wrist to correspond with the body, and surmounted hy a half sleeve of a new form trimmed with crape. A high standing collar partially displays a mourning ruff. Claremont bonnet, so called because it is the same shape as the one recently worn by the Princess: it is composed of black crape over black sarsnet, and is lined with double white crape. The crown is rather low, the front large, and of a very becoming shape; it is tastefully finished by black crape, and ornamented by a bunch of crape flowers placed to one side. Black shamoy gloves, and black shoes.